The new XPC P20U from Shuttle is an all-in-one PC barebones unit with fanless design and water/dust-proofing. Equipped with an 11-6-inch multi-touch display, this model makes for an excellent IoT or PoS terminal. Specs include the Intel Celeron 3865U CPU with the HD Graphics 610 GPU plus support for up to 32 GB of DDR4 RAM and room for a 2.5-inch HDD/SSD along with an NVMe SSD. Best known for the quality mini PC barebones it has been producing for the past two decades, Shuttle is exploring new designs with all-in-one models like the new XPC P20U barebones unit that comes with an integrated 11.6-inch touchscreen. Additionally, the P20U features a fanless design and it only measures 11.7 x 10.6 x 1.9 inches, including the cable collector box at the bottom. Display-wise, the P20U allows for multi-touch gesture-based usage, which is common on smartphone models, and it also received an IP54 certification, making it water/dust-proof. The unit itself includes 3X VGA and 1 x HDMI connectors for multi-display setups. 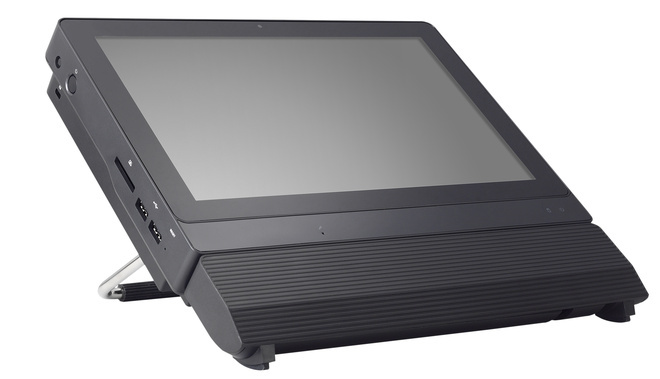 As a touchscreen solution, the P20U is targeted at the IoT applications, Point-of-Sale and office environments. The specs are not that impressive, but user can add components to their liking. The default unit comes with an Intel Celeron 3865U dual-core CPU clocked at 1.8 GHz, which also includes the HD Graphics 610 GPU. RAM and storage are not provided, but users can add up to 32 GB of DDR4 RAM and a 2.5-inch HDD or SSD along with an NVMe M.2 SSD. As far as ports are concerned, apart from the video outputs, the P20U provides six USB-A connectors, two RS-232 interfaces, and audio in/out. The Internet connection is handled through a 4G modem and WiFi + Bluetooth with attachable antennae, plus a GbE jack, as well. Other options include a webcam with integrated microphone and a single speaker. Shuttle’s P20U is available now for the European region with an MSRP of around US$310.